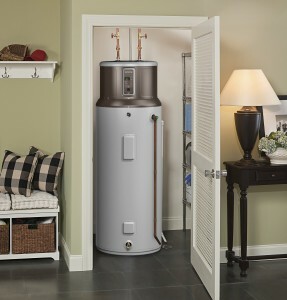 A Geospring Pro Heat Pump Water Heater is a versatile hot water solution for Maine homes. Each person in the average Maine household uses 20 to 35 gallons of hot water per day, and many households rely on their home’s boiler to heat their hot water for them. While this set up may make sense during the winter months when your boiler is producing heat to keep your house warm, when summer rolls around and your heat is no longer needed, your boiler has to run to produce hot water. During these non-heating months, you may not need hot water for hours-long stretches per day, but your boiler will be working to keep your hot water at the proper temperature. Removing your home’s hot water needs (which we call “domestic hot water”) from your oil boiler is a smart choice, particularly when the appliances available can produce hot water at much higher efficiency rates and cost so little to run. A hybrid electric heat pump water heater is the ideal solution for homeowners who want to take their hot water needs off of their boiler. If you are heating with oil, this solution can easily reduce your oil consumption by 200 to 300 gallons or more per year and provide comparable savings with propane or natural gas. Hybrid electric heat pump water heaters use the same technology that is used by your refrigerator — but in reverse. Heat is removed from the ambient air surrounding the water heater by a fan, and then the heat is absorbed by refrigerant in a coil inside the unit. The heated refrigerant is then compressed to raise the temperature further. Finally, that heat is circulated to your water tank through a “heat exchanger,” which is essentially a copper coil inside of your water tank. The entire unit is insulated thoroughly to reduce heat loss. Hybrid electric heat pump water heaters primarily rely on this heat pump technology, but on the coldest days when your basement may be very cold, the water heater has resistive electric back up. In other words, if the heat pump can’t pull enough heat from the air in your basement, efficient electric heat kicks in to pick up the slack. Heat pump water heaters cost very little to run and have the added benefit of dehumidifying your basement as they run. They are generally 270% efficient – in other words, for every unit of electricity used to run it, it will generate 2.7 units of heat. And best of all, they qualify for $300 in rebates from Efficiency Maine. Read more about Heat Pump Water Heaters at our Solutions hub, or get started today! Call for your free in home heating assessment and find out if a heat pump water heater is right for you.